The Canada Goose Beechwood was the one I actually saw in store in Bloomingdale's and was drawn to immediately because it looks small on the hanger due to the drawstring waist. This was by far my favorite of all the ones I tried on, though A and a good friend both told me they felt it made me look like I had a pouch, which means I looked pregnant! That made me a bit doubtful but in the end, I do definitely prefer it to the Victoria because it really does fit a bit smaller, despite the pouch, which may be due to the pockets (which I absolutely love because they're so cozily lined with fleece!). The hood is not as nicely snug as the one on the Victoria but it does work very well when the jacket is zipped all the way up since it does go very high up so your chin and mouth is protected from the cold with cozy fleece lining. Though it has the same warmth rating from Canada Goose, it is surprising to note that I definitely feel this one isn't as warm as the Victoria, which may be due to the puffy part of the body, which is disappointing, and it's important to note that I see little feathers peeking out here and there too. 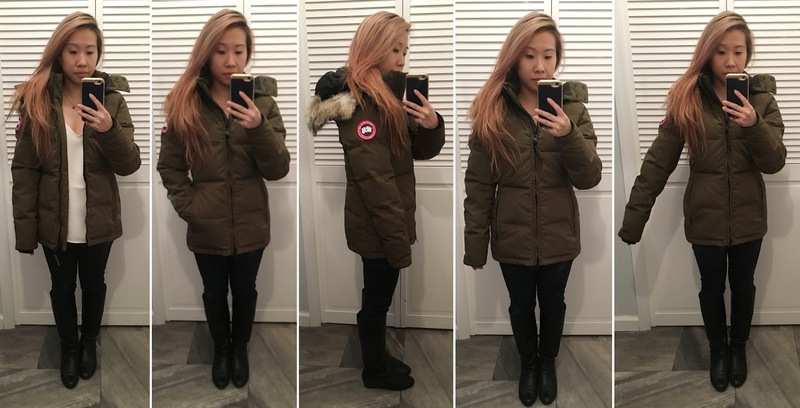 This is the Canada Goose Chelsea Down Coat and I actually like this one a lot but I'm really looking for one a bit longer. Though this is quilted, the material is the same as sleeves of the Beechwood so I believe this would be just as warm as the Victoria. 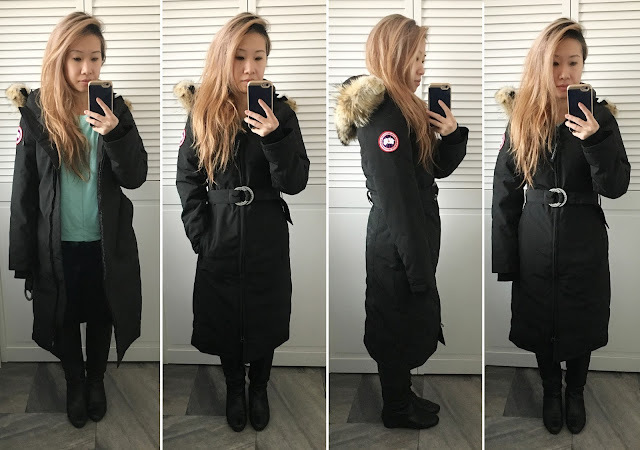 The sleeves of the Chilliwack Bomber are super long, as you can tell in the photos. The bomber length is also not ideal for the frigid winters we have but it's cute to note this is one of the styles that's also available in mens. This one is the popular Kensington style, which was actually quite big on me so I am not a fan of it. I am also not a fan of all the little loops that you have to secure around the buttons, which I know I would never do when wearing this, especially with gloves on. I definitely prefer a simple zip-up style to this one but the longer length would be warmer. This is the only style, however, that has a nice fur lining inside the hood as opposed to fleece or microfiber. The sleeve of the Lorette was noticeably long so I wasn't a fan of this one from the start but the length is nice and long on the body. The Montebello Parka seems very similar to the Rideau Parka except there is a zipper on the sleeve and fur on the hood. I like the collar of the Rideau a lot but the sleeve is too long here too. The overall fit is pretty good but it is also a bit shorter than what I want. 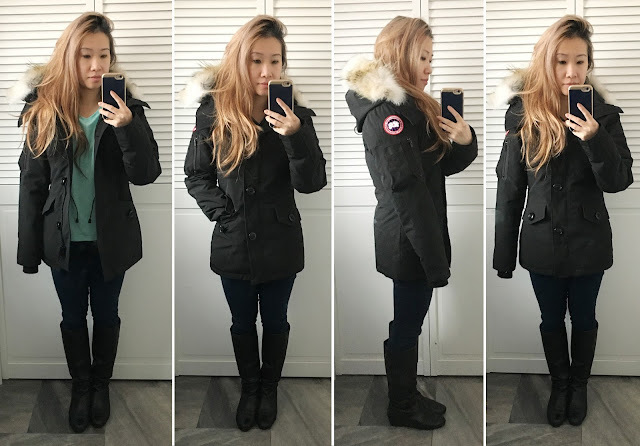 It's interesting to note this is about $100+ less than the other styles since there is no fur on the hood, which I think does offer some more warmth. 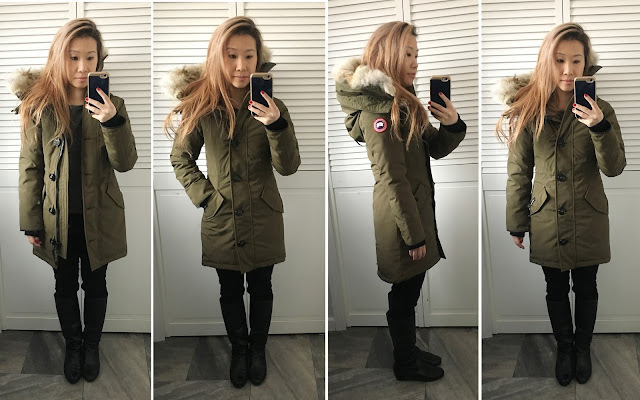 Before seeing this one in person, I thought the Rowan Parka would be the One since it is kind of the opposite of the Beechwood Parka, which I loved in that the body has the classic Canada Goose smooth fabric while the sleeves are puffer. However, it is quite uncomfortable to wear when I put my cell phone in my pocket because the location of the pockets is very badly designed. When walking up steps or down steps, you can feel the phone in your pocket jam into your leg and the bottom part of the jacket is quite slim so there isn't much room for comfort. The belt is cute though, with a leather ring. On the other hand, the sleeves of the Rossclair were surprisingly not as long as the other styles. There is an inner ribbed cuff on these that normally peek out of the other styles as you can see, but for this style, they stay nicely tucked in so the sleeve is noticeably shorter when worn. 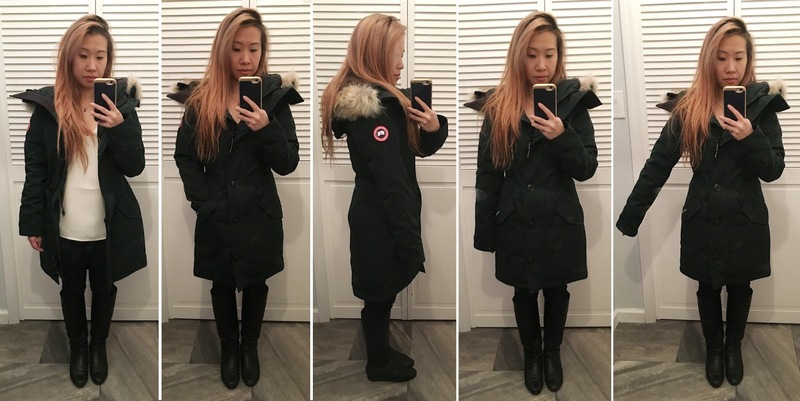 This style is definitely preferable to the Kensington since the buttons are bigger but I didn't love this one on me. The Savona Bomber is super cute. 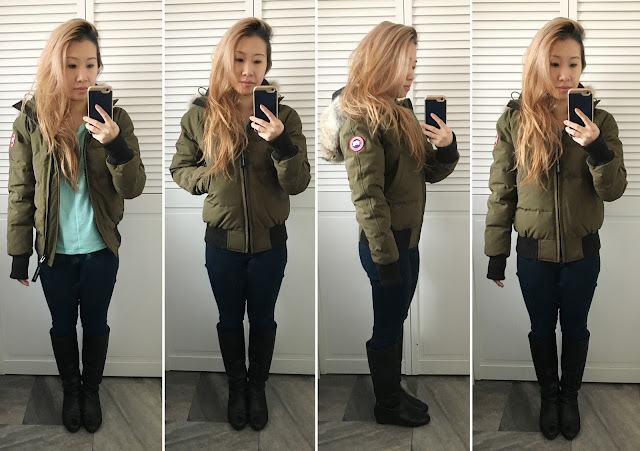 Though the sleeves are long, this one is my favorite bomber style and I also feel I'm partial to the Military Green color. The Shelburne is similar to the Lorette but has the more standard quilted pattern on the body. 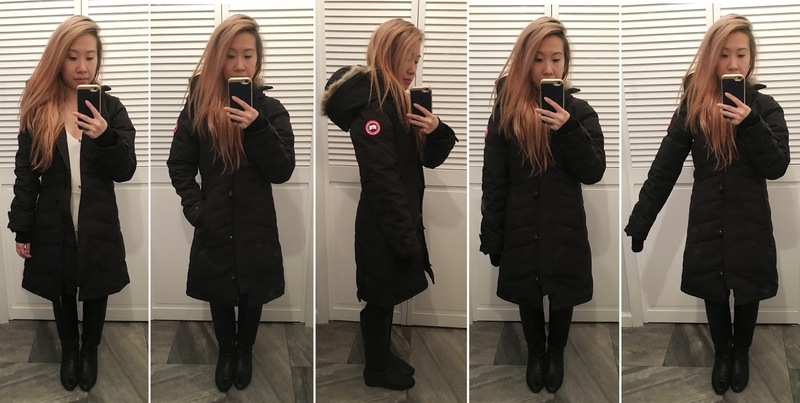 Like the Lorette, the sleeves were much too long though the coat itself is nice and long on the body. The buttons on the cuff of this one was also quite strange because it is cuffed too tight, which makes it quite bulky and restrictive but when loosened on a different button, the sleeve opening becomes too loose. I was really hoping the Trillium would fit because it is such a cute style but it was unfortunately very big on, as you can see. The fusion fit version would probably be more slim on the body but I couldn't find that fit in a XXS. 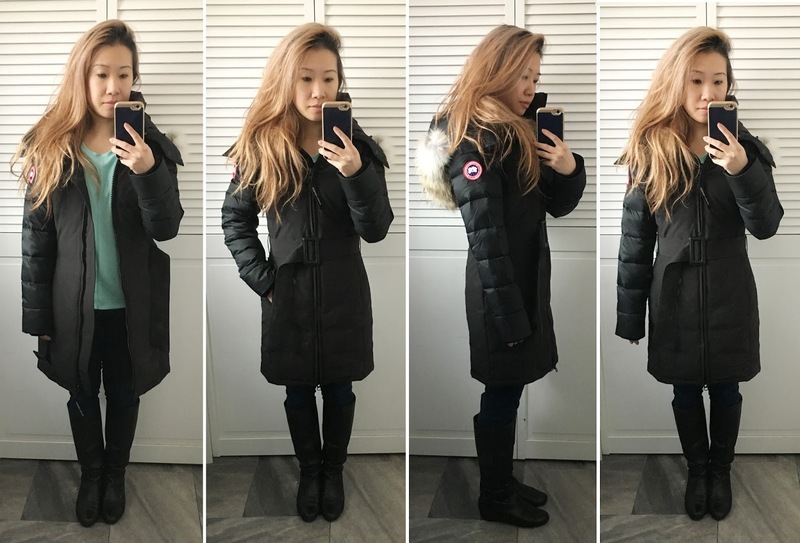 The Whistler Parka is definitely more petite-friendly in length than the Mystique as reviewed here, but the sleeves are still too long and belt too low. I also prefer the leather buckle on the Rowan to the heavier metal ones here. 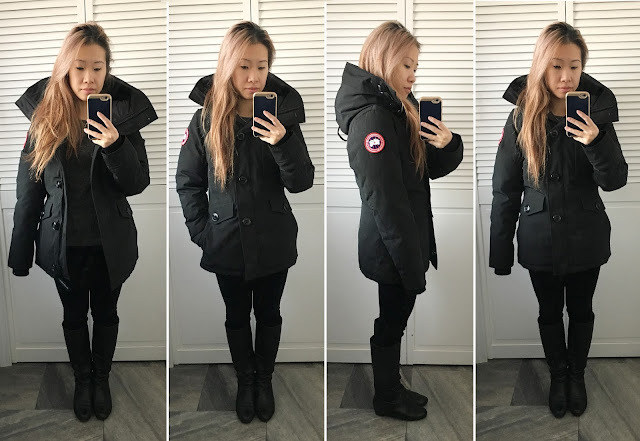 After such an exhaustive and thorough search for a Canada Goose coat, I've JUST realized when looking through the Canada Goose website that I made a huge mistake in not trying their new fusion fit, which is the "ideal fit, comfort and protection for smaller body frames." 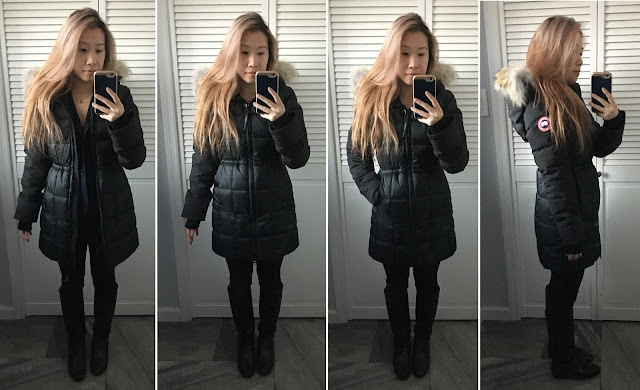 I want to hit myself because I wasted so much time trying the above jackets! Fusion fit means the sleeves are shorter (! ), hem is shorter, and hoods have smaller proportions. I have since quickly ordered the Rossclair, Trillium, and Shelburne in fusion fit and am eagerly awaiting the package to see how they fit. 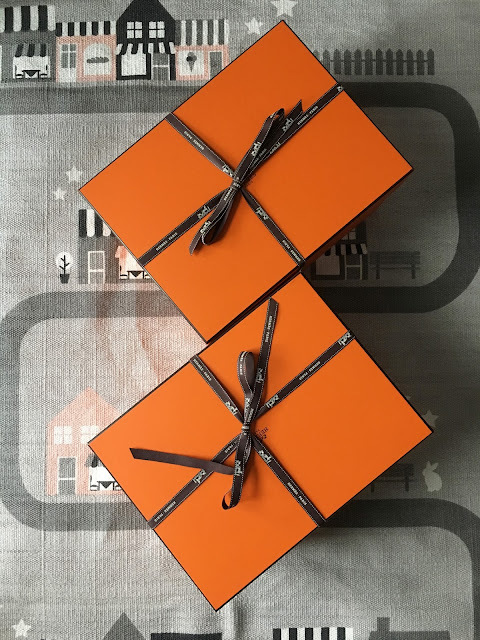 Hi, awesome post and informative! I'm also debating to purchase a canada goose jacket. Most likely the Victoria but I am trying to do some research first so I don't have to go through the hassle of returns. It would help if I knew a little more about your height and physique. I am 5'2 and about 100 pounds. The victoria doesn't come in fusion fit so I'm wondering if I should just get XXS for it. Hi, thanks for doing these reviews. Wish I found this sooner. I just bought the rossclair regular fit XS. I like the length and style but the sleeves are a bit long and the bust area feels a bit big. However I want some room underneath for mobility as I will be doing activities in the coat or just to layer a sweater. I'm 5'0 and 112 pounds, bust:32, waist:28, and hips:34. Based on this, do you think I should get the regular XXS or the XS fusion fit? How much shorter is the fusion fit compared to the regular? I'm scared that the XXS will be too snug on me and the fusion fit may be too short. Please help! Hi Winnie! I think both the XXS regular and XS fusion fit would work for you if the XS regular sleeves are only a bit long for you but if you have to choose between the two, I would go with the XS fusion fit because I don't think it would be too short on you since it was made for us petites, while the XXS may be a bit snug. I hope this helps and it turns out fitting well! 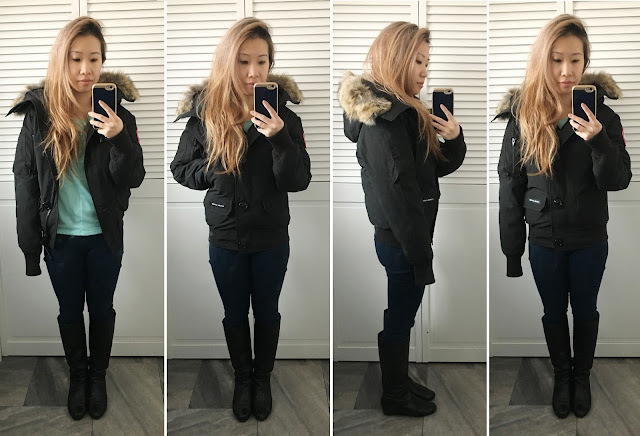 Im 5"4 and a half and 115-120 pounds so I'm not sure if I'm particularly petite but I'm having a hard time choosing between the fusion fit and regular, and whether to get XS or S... and I don't like when things are tight in the arms and restrict movement. Do you think I'd need the fusion fit? Hi Nicole, so sorry for the delay! If you don't want the arms too tight then I would definitely stick with the regular size instead of fusion fit unless you have short arms (always finding sleeves too long). Hope this helps! Hi. Good job for your blog, very helpful information. I have tried their Rossclair in regular S and XS. In XS the sleeve size was good, but waist a big snug, in size S the sleeves are too long and look slightly larger. I'm debating if I should go with Fusion Fit size S or XS. Also, do you remember finding Trillium heavier than Roseclair?